I need to get some less expensive tastes... $50 just seems way too much to spend on 12 beers. Regardless, the St. Bernardus was awesome as always. It's a quadrupel, so very high in alcohol content for a beer... 10.5% I believe. There aren't many examples of this style that are well executed from the States, but Three Philosophers from Ommegang and FOUR from Allagash are both very good, and a fair bit less expensive. I've seen Three Philosophers in Trader Joe's here in Boston, so it's pretty widely available at least. Though they both come in big bottles so if you're a "glass of wine a day" type drinker, you'll need one of those champagne stoppers. I have one and it works quite well, even if it's a bit cheaply constructed. Scaldis(Bush Ambrée) is also a quadrupel, and this was my first time trying it. 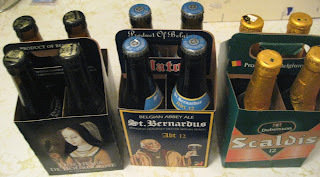 I'm not sure I have anything solid to say, except that I thought the alcohol taste was a little too strong and unbalanced... and unlike St. Bernardus, better beers than Bush Amber are easily available... I'd take a glass of either of the aforementioned beers over it. Not to say it was bad, but it's certainly not top of the class. After two quadrupels, Duchesse De Bourgogne is quite a change of pace. It's a pretty unusual beer, and if you've never had a Flanders Red Ale before I certainly recommend giving it a try. They're quite sour... like a kick in the teeth, and they stun your taste buds for a long stretch, so it's not a style of ale to have with dinner. It's a bit of an acquired taste, I'll admit... but it's just so different that I think everyone should give it a try.